Why Is it Important to Know About Your Ecological Footprint? How Does Recycling Paper Affect the Environment? Society depends on natural resources for food, shelter and nearly every other aspect of life. According to the U.S. Census Bureau, the world has more than 6.8 billion people as of August 2010. Humans must find ways to conserve and replenish natural resources so future generations have access to clean water, breathable air, and supplies for fuel and production. In 1960, the average U.S. resident produced less than 3 lbs. of garbage per day. By 2008, that figure had risen to 4.5 lbs. or about 250 million tons of trash per year. Two-thirds of this garbage ends up in landfills. About 31 percent of all garbage produced consists of containers and packaging. Most of our garbage can be composted, such as food scraps and yard trimmings, or recycled, as in the case of paper, plastic, glass and metal. The products we use each day are made using natural resources, some of which are non-renewable. For example, plastics, which make up 12 percent of municipal solid waste, are mostly made from petroleum. The Colorado River Commission of Nevada estimates that in about 98 years, we will have used up the world’s supply of petroleum. Making products from renewable resources still has a detrimental effect on the environment. Harvesting these resources often destroys ecosystems and animal habitats. According to the American Forum for Global Education, 25 percent of all lumber harvested globally is used in paper production. Processing raw materials into useable products produces waste as well as water and air pollution. You can lessen detrimental effects on the environment by conserving water, fuel and energy. The Natural Resources Defense Council recommends that consumers unplug electronic devices when not in use, and purchase energy-efficient appliances. Consolidate trips or use public transportation to consume less fuel. Turn off the tap when brushing your teeth. Consider supplementing your home electricity with alternative energy sources such as solar and wind power. Several small steps like these add up over time to benefit the environment, and you often save money as an added bonus. Reuse means that an item is used several times before going in the trash. For example, let children draw on the back of scrap office paper. Donate unwanted clothing and household goods to charity rather than trashing them. Finding creative ways to turn a used product into a new item of equal or greater value is sometimes called upcycling. Examples of upcycling include turning bottle caps into magnets or using old T-shirts to make a quilt. When you recycle, items such as paper, plastic, glass and metal are taken to processing centers. At these facilities, the recyclables are cleaned and then undergo a process that turns them back into useable goods. Contact your city or county government to find out about recycling programs or facilities near you. Many areas have curbside pickup of recycled goods such as splastic, glass and aluminum. 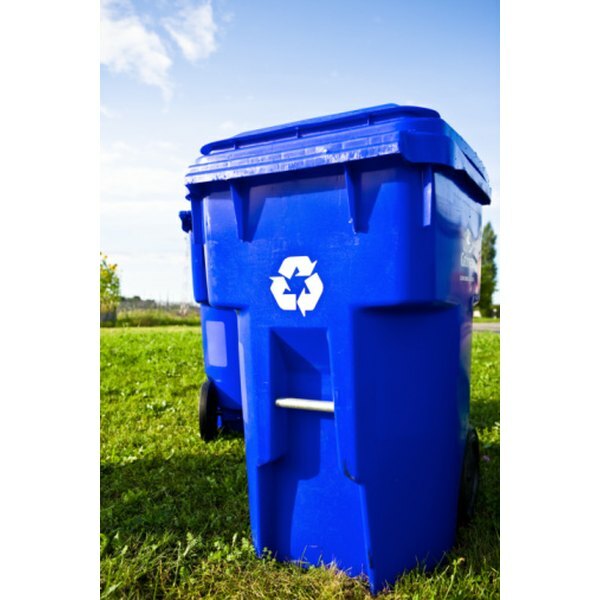 Other areas have regional recycling facilities that accept a variety of recyclables. American Forum for Global Education: What Is Deforestation? What Is the Difference Between a Renewable & a Nonrenewable Resource?